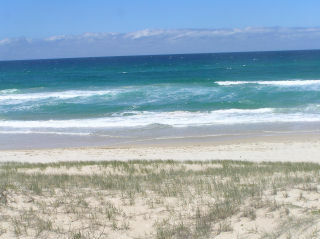 When looking for beach structure we distinguish features mainly by colour and wave movements, a similar approach can be used for spotting individuals and schools of fish in the surf. This may sound like an oxymoron but what you are going to be looking for are things that shouldn't be where they are and should not be doing what they are doing. Dark patches that move, ripples in otherwise calm areas, splashes where there is no turbulence, moving shapes and shadows can all be indications of fish, but just to complicate matters some of these things at times may only be sea weed, jellyfish or simply shadow from dispersing foam or an isolated cloud. This time instead of average weather and sea conditions we are going to assume optimal conditions and take a fantasy walk along the beach to spot some of the most likely species. We have come to a large V shaped gutter with a bank starting from the shore and projecting into the ocean at approximately a 45 degree angle into progressively deeper water with a second bank outside of it giving us the best chance of spotting almost any fish species we wish to find. Starting from the beach and working out, we watch a wave wash up on the beach and as the foam clears and the wave recedes notice a thin shadow that upon closer scrutiny also has the opaque shape of a whiting just beside it that quickly disappears into the turbulence of churning sand thrown up by the meeting of the receding water and next incoming wave. You have to be quick, few fish will hang around long enough to smile so you can take their picture. A slow moving dark roundish shape appears in the bottom of a following wave as it prepares to break. It could just be a discarded plastic bait bag drifting along in the current, but a cast past and retrieved along the line it is moving has the rod buckling under the weight of a good sized bream. In the middle of the V gutter a mullet jumps and gives away the position of a small group of mullet swimming along near the surface with their fins breaking the surface (finning). A good sign as usually where there are mullet, bream, tailor, jew and a few other species will be close by waiting to take their toll on the poor old mullet schools numbers. Our attention now focuses on several manhole sized shapes casually moving against the current near the bank, something definitely alive and swimming to do that, and watch as the school of rays slowly move on. Time to get our feet wet and as we quietly walk out along the shallow bank of the V gutter notice whiting slide a safe distance away from us before we disturb a good sized flathead that had positioned herself atop the bank and dashes away to the safety of deeper water pursued by several smaller accompanying males. Several terns swoop down into a solid but changing dark patch of water between the two banks and pluck out small baitfish as mini eruptions of water that resemble a stick being quickly swept through the water but originating from beneath them discloses the presence of long toms and probably trevally. On the reforming waves inside the outer bank small pock marks not unlike what happens when a stone is dropped into the water signals the destruction of more baitfish as they are hit mercilessly from below by hungry tailor. Just inside the clean face of a soon to start breaking wave shows several fish riding it in and sweeping off to one side just before it breaks, demonstrating a fairly typical school of dart. On the back of the outer bank a large black shape is making a beeline for the outlet that will bring it into the gutter we are wanting to fish, while standing in the thigh deep water of the V gutters bank. A glance at one another and the decision is easily made to retire quickly but calmly back to the beach, while at the same time maintaining a visual of the dark 2 to 3 metre shape closing the range. After all something like that which hasn't gone "Pffft" in the time we have been watching it can only be one thing. It's a shame every day couldn't be like that but often you will get to see at least two or three of those I described if you are observant. The shark in the last passage won't happen very often at all, but can happen so keep your eyes peeled because we want fish for dinner not to be dinner for fish.